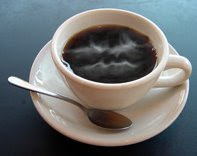 The Coffee Curmudgeon: a post. They say, “be careful what you wish for,” but screw them. “Careful” never got them anywhere. Life is about taking the risks that you shouldn't, so that you can find that which you deserve. Just as one's destiny isn't sitting, waiting for him or her around the corner, even trivial effects-- those which truly matter and make life worth living-- will not come around to sit on your shoulder just because you think of them and believe you're due your turn. Dreams do come true, but only for those who choose to pursue them, all caution aside. Any financial guru can tell you that a high risk comes with the possibility of the highest reward. What, then, is the point of settling for anything less? Take your chances, and be rewarded. If you fail, the principle of living in a world of forgiveness and second chances has your back. If you fail so badly that you want to just give up, you clearly missed the point. To fail is to live. To achieve is to love every moment and be loved by those who matter. To try at a second chance is to acknowledge that you need to truly live to find love. Nothing second-rate. Nothing you never wanted. Just “now” and a world of “wishes”. Don't be careful, because even if it pays off, you will know there is something better.